1) Space Makers STEM camp (ages 6-10): Kids will have a ‘blast’ during this educational week that's jam-packed with hands-on projects, such as assembling a 4’ tall space pod, launching rocket ships from recycled bottles and making martian-mud, aka slime! 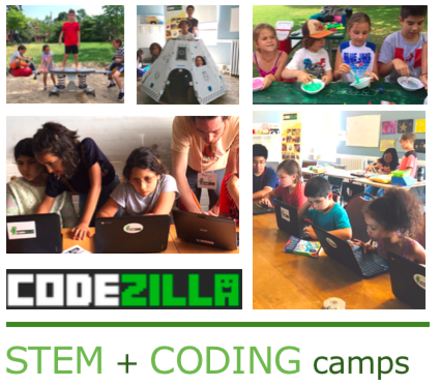 2) Game Makers coding camp, Level 1-2 (ages 8-14): code dynamic video games using Scratch, a kid-friendly programming language created by MIT. Kids use their creativity and imagination to develop characters, backdrops and games with graphics, sound and animation. Non-violent, gender-friendly games and projects.